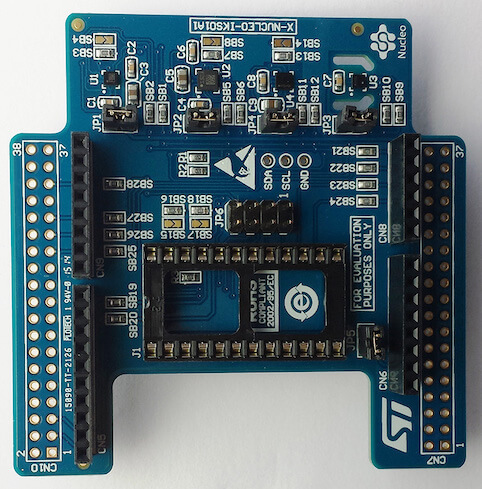 The X-NUCLEO-IKS01A1 is a motion MEMS and environmental sensor evaluation board system, compatible with the Arduino UNO R3 connector layout. It includes an STMicroelectronics’ LSM6DS0 3-axis accelerometer and 3-axis gyroscope, the LIS3MDL 3-axis magnetometer, the HTS221 humidity and temperature sensor, and the LPS25HB pressure sensor. The X-NUCLEO-IKS01A1 interfaces with the main board via an I2C interface. More information about the board can be found at the X-NUCLEO-IKS01A1 website . An example on how to use the x-nucleo-iks01a1 shield is available in the X-NUCLEO-IKS01A1: MEMS inertial and environmental multi-sensor shield application documentation (see Shields for more details).